I thought that "Villadonga" was a place in a Crocodile Dundee movie, but a visit to the Castro de Villadonga soon put me right. 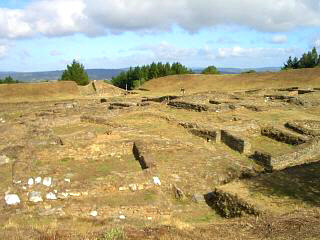 The Castro is quite close to Lugo city in central Galicia and is not a town, but rather the remains of an ancient Celtic settlement with a visitors center or museum associated with it. In Galicia these old Castros are now being discovered on a regular basis and have significant archeological value, not least because they reinforce the claimed connection of Galicia with the other former Celtic nations. Galicia's castro's have a distinct look about them and this one is no different. What is different is the professional way in which it is maintained and displayed and the fact that it appears to be fairly complete. 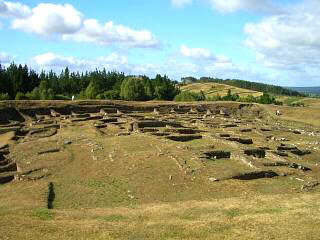 That is, there is a high circular earth mound surrounding the settlement and you get the feeling that you are looking at the remains of a complete and almost intact village. Above, this is just a small area of the complete Castro de Viladonga. That said don't get your hopes up too high, Castros could, pessimistically, be viewed as nothing more than an ordered collection of rocks, but they are in fact the remains of Celtic villages. This one is however quite impressive and you can walk around it and through it, but not over the remains themselves – unfortunately the same is not true of many other castros that are treated like assault courses. A further advantage that these remains have is, that by walking along the surrounding mound, you can easily look down at the layout of the village and formulate your own view of how it might have appeared 1500 years ago. 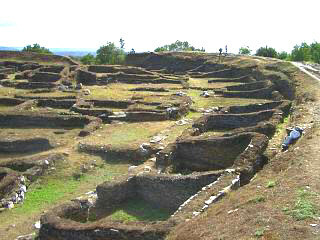 The picture to the left indicates the elevated postion of the castro which is common to all such ruins. It had the dual advantage of placing these villages in a more easily defended high point and also made the settlements difficult for invaders to spot from the ground. When you have finished taking in the ruins (or before if you prefer) you can visit the Castro de Viladonga museum which is adjacent to both the castro and the car park. The complete visit is free, although I think we paid a Euro for the guide book (Spanish only). The castro dates from somewhere between the third and fifth centuries and was uncovered during an archeological dig in 1971. It is from the "Galaico – Romano" era and is made up from a multitude of walls and ditches which originally formed houses, paths, areas and structures for working and keeping animals as well as the protective parameter walls. Although a significant settlement has now been unearthed, further excavations are expected to uncover more ruins and there is also a cave which we did not see. 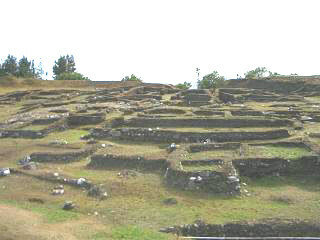 The Castro's place in pre-history commerce is supported by "caminos" or roads that run north to south and east to west at the junction of the castro de Viladonga. There is also an interior "Ronda" which runs in parallel with the settlement's outer most walls. The shot above shows a close up of a collection of the castro's former buildings. Whether they have been excavated to the original ground level or not we could not determine, but in any event they would have been roofed in timber. On the ground the dwellings are in multiple cluster and single or double units and there are also remains (although I did not spot them) of sinks and holes created for poles. In truth you need a fair bit of imagination to visualize how things must have looked, but it is clear that some kind of human grouping inhabited this place at some time in the distant past. A better indication of the villages appearance, way of life, tools and culture can be discovered by taking a look at Viladonga's museum. Left, a final shot of the Castro de Viladonga.